Welcome to the Ars Vercanus web space. This site is the online home of Vercanus Magick and the book “Ars Vercanus – Advanced Magickal Techniques”. Our site serves as forum to teach and discuss Vercanus Magick. Additionally, this web space serves as a gathering point for the discussion of occult, philosophical, and paranormal topics. 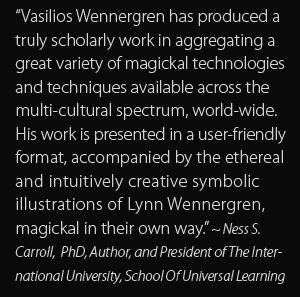 A philosopher, mystic, and scholar, Vasilios Wennergen has immersed himself in an extensive anthropological study of the mystic, shamanic, and magickal practices of various cultures and traditions. This occult research and experimentation has spanned over 20 years and ranged from working with rainforest healers, to training in Eastern martial arts and mysticism. Vasilios has conducted an in-depth study of the philosophical, sacred, and arcane texts of humanity’s rich magickal heritage. He has drawn upon this body of knowledge and his own intensive practice of ritual magick to distill core techniques and concepts from the corpus of cross-cultural mystic and magickal practices. Vasilios is inspired by the natural beauty of Santa Barbara, California, where he resides with his wife Lynn and his son.